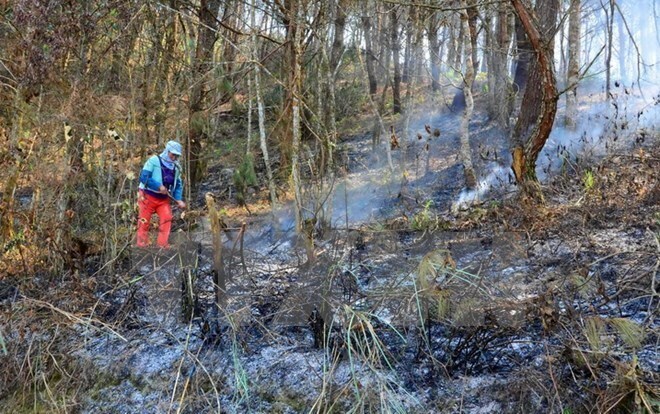 Lao Cai (VNA) – So far this year, 181 forest fires occurred in 19 northern provinces, destroying more than 2,400 hectares of forest, heard a recent conference held by the Ministry of Agriculture and Rural Development in the northern mountainous province of Lao Cai. The figures represent a decrease of 97 cases but a rise of nearly 1,900 hectares of damaged forest against the same period last year, Nguyen Quoc Tri, deputy head of the Vietnam Administration of Forestry, said at the November 4 conference, which reviewed forest management in northern provinces in 2016 and put forth tasks for 2017. There were many big fires which burned down over 100 hectares each, mostly in northwestern provinces. Son La Province had the largest area of forest destroyed by fire (969 ha), followed by Dien Bien Province (919 ha), Ha Giang Province (159 ha) and Yen Bai Province (141 ha), he noted. Tri blamed the wildfires on prolonged and large-scale hot spells, plus extreme weather events like the severe cold snaps at the beginning of this year. Participants at the event admitted that forest firefighting in key areas has yet to receive adequate attention, as reflected in a lack of drastic actions to protect forests and strict punishments for violations. Poor equipment and limited personnel are other problems in the work. Representatives from localities such as Son La, Yen Bai, Tuyen Giang, Phu Tho and Ha Giang proposed improving the efficiency of State management over forest fire prevention and fighting, and mobilising on-the-spot resources.